Stuart Mitchell�s �Seven Wonders� is presented in a cardboard gatefold package. There�s no booklet and very little information about the music. On gaining some first impressions one realises that the music is pretty much self-explanatory, requiring no detailed analysis. Experienced collectors should already have gleaned some insights from the grandiose title and the cover, on which a representation of one of the great pyramids emerges from a gloomy, Yves Tanguy-style skyscape. The legendary Seven Wonders are taken literally, and each is given programmatic treatment. Such grand subjects demand a broad canvas, and Mitchell is lucky to have the services of the Prague Symphony Orchestra and the Kuhn choir at his disposal. 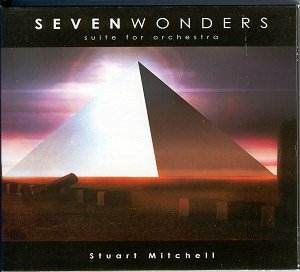 I have a sneaking respect for composers who are able to wear their hearts on their sleeves, and �Seven Wonders�, which took fifteen years to complete, is obviously a project which is of very personal significance to Mitchell. He certainly has no lack of confidence in the effect of his music. In the brief notes he states, "Seven Wonders Suite for Orchestra is a celebration of human artistic endeavour. After a 1000 year absence, these great monuments are brought to life again through the power of music and the imagination of the listener." I have noted some enthusiastic responses from customers announcing their satisfaction with this CD on the web, and on hearing the music during the recording sessions the director of the Czech National Orchestra chose movements from the piece to be performed twice as part of their 2006 season. I therefore freely accept that my opinion is subjective, and while I am always reluctant to criticise out of hand, I am sorry to say that �Seven Wonders� is consistently and spectacularly awful. Having said this, I am obliged to say why I think so. For me, new music should be just that � new, or at the very least �renewing�. No matter how strenuously some composers may resist a connection with the past, we are all saddled with history and tradition. The �Antique� style will pop up now and again, with composers either making witty comment, or respectfully honing their skills by acknowledging their musical forebears. Listening to this piece however, I find myself gathering composers� names by the minute, and like a magpie � here�s a bit of Samuel Barber, some Holst, Khachaturian, Delius, Sibelius, Elgar, Howells, Vaughan Williams � the list seems endless. It�s like something cobbled together by a truckload of hackneyed film composers, but with all the �Lawrence of Arabia� and �Ship at Sea� chestnuts unbelievably being given yet another roasting the whole thing turns full circle and becomes a parody of a parody. I challenge anyone listening to this �blind� to identify the music with a single personality. I find the only real challenge here is trying to discover where Stuart Mitchell�s own musical character lies. As pastiche, this work is a treasure-trove, but in taking itself so seriously the joke is, unfortunately, on Mitchell. The intellect is unchallenged here by innovation, dissonance or any noticeable harmonic astringency or individuality. While there are tunes aplenty, they seem to be as consistent and as memorable as a weather forecast. This lack of confrontation with any sense of musical peril will no doubt appeal to many people, but it is possible to create a tonal and emotionally expressive musical idiom while maintaining a recognisable identity. Say what you like about Arvo Pärt or Malcolm Arnold, but you can almost invariably spot their individual voice as soon as �the needle hits the groove�. �Seven Wonders� re-hashes just about every orchestral cliché imaginable, and the result is magnificently and appallingly anodyne. The performance is honest and well executed and the recording is fair, although there is some compression on peaks. A quite heavily perfumed layer of artificial reverberation appears to have been added to help glue everything together. Listeners who enjoy the ecstatic escapist romanticism of Hollywood film music will probably find much to enjoy here, and those who have been preparing slide or video shows of exotic holidays should have this CD available for use as a soundtrack � it will enhance your presentation no end.